The courses are taught by a working industry professional with over 20 years experience in the film, television and theme park industries whose credits include: The Hobbit, Matrix 2 & 3, Scooby Doo, House of Wax, Ghost Rider, Queen of the Damned, Anacondas. 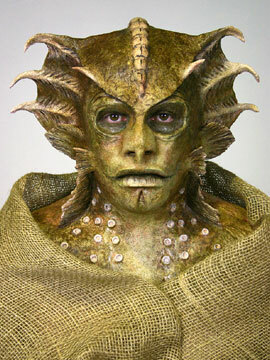 The Advanced Makeup Effects Course is the most in depth course of the Sharp FX courses. It is designed to teach students the knowledge and understanding they need to create a multi-piece prosthetic makeup at the highest level. The course gives students the skills to start a career in the exciting industry of special makeup effects. Covering all aspects of creating a full head multi-piece prosthetic this is the most comprehensive prosthetic makeup effects course Australia wide. The Advanced Makeup Effects Course is held on a Sunday from 9am – 5pm for a period of 25 weeks at the Sharp Fx workshop in Springvale, Melbourne, Australia. The creation of a prosthetic will usually start with a life cast of the actor or model. Learning how to get an accurate cast of your model is essential if you are serious about creating prosthetics. Learn the skill of life casting, what materials to use, looking after the model and how to get the best cast possible. (This course is highly recommended for students who are planning to enrol in the Advanced Prosthetic Makeup Effects Course). Sharp FX teaches part time Advanced Prosthetic Makeup Effects Courses in their fully operational workshop located in Melbourne, Victoria, Australia.